If you love tapas and want only the very best, you can now enjoy them at Santi's at Marina Bay Sands. Their elegant tapas bar and lounge sits right at the entrance, seats 20-30 and offers visitors lighter Mediterranean bites. Famed Catalan chef Santi Santamaria (pictured above, centre) says, "This is the first time I am introducing a tapas bar concept anywhere in the world. It offers diners a glimpse of the taste and quality of the gastronimic offerings we have in Santi's main dining room, and it's perfect for those who prefer a lighter menu in a more casual and informal setting." His daughter Regina (pictured right) runs the Singapore restaurant. Both of them warmly welcomed some Southeast Asian media for a tasting when the tapas bar opened in August. 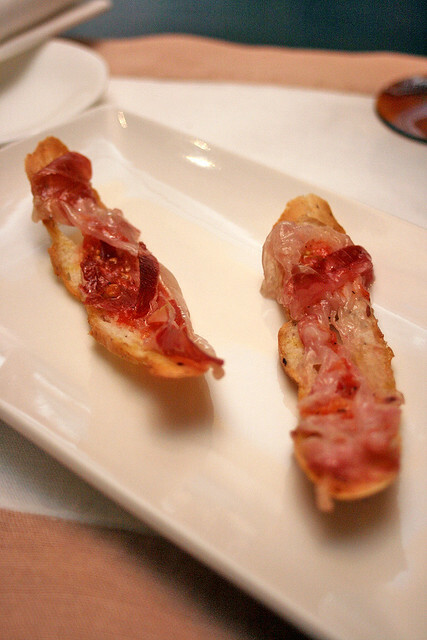 There could be no better starter than the assortment of Iberic Charcuterie Platter with "pa amb tomaquet" (tomato toast). Unabashedly fatty and fragrant strips of divinely cured pork! These salty slivers are simply divine atop the crisp bread with tomato and olive oil rubbed in. I secretly yearned for more. We were then treated to a Mushroom Confit that was a burst of savoury flavour. The Octopus Plancha we eyed nervously, thinking of many an overly chewy Japanese tako. But eyes flew open as we bit into the piece of octopus - it was warm, it was soft and it yielded. It's absolutely amazing, unlike any octopus I've had before. We were told that in Spain, they beat the octopus to tenderise it. And then, Gazpacho with Crab, embellished with a whimsical smile. This Spanish tomato-based soup is made with olive oil and almonds here. 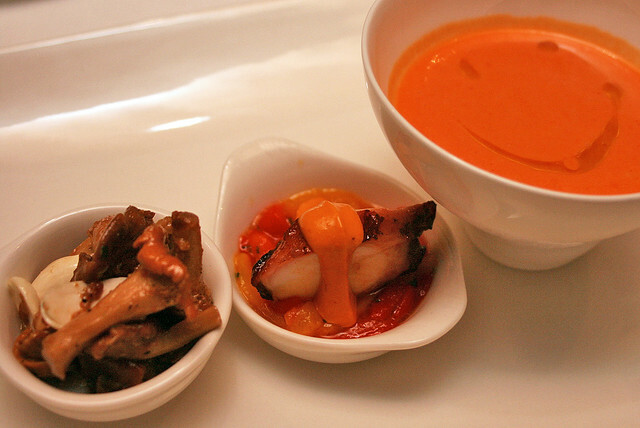 Langoustine with sofrito and migas, quail with foie gras escabeche, and razor clam stew. All of which were little adventures in taste and texture. I particularly liked the quail and foie gras, which has been poached in an acidic marinade. Seems the Spanish used to preserve their meats by poaching with olive oil and vinegar, in the days before freezers. The foie gras became almost light and sweet. 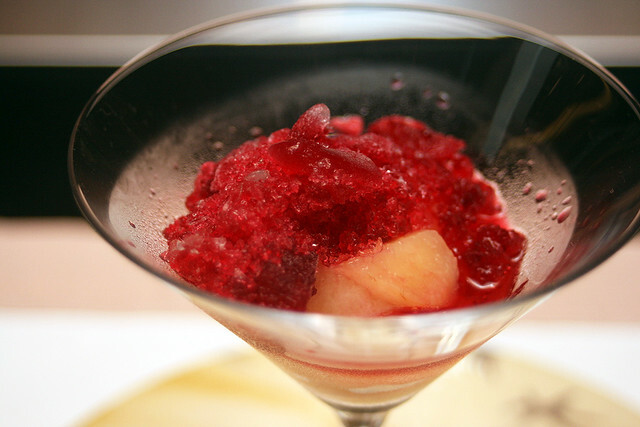 Rounding off the meal was an exquisite iced dessert. Japanese peaches with hibiscus granite. A lovely sweet and tart palate cleanser. A sommelier here will also be happy to show you the same wine menu available in the restaurant. 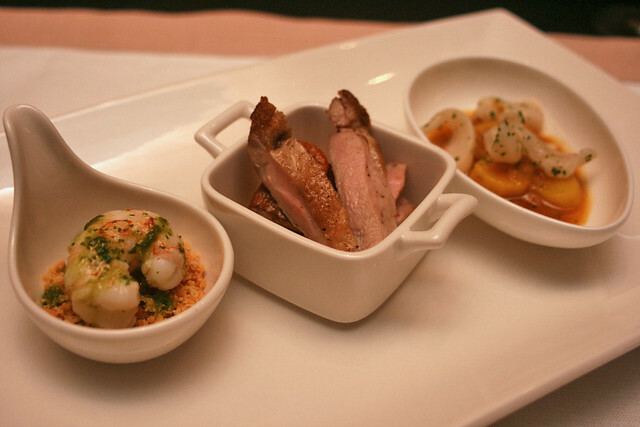 The tapas are available in two menus (S$60 and S$90) for four to five sets of tapas including dessert. This is a good way to sample Santi's cuisine if you're undecided about forking out three-digit sums for dinner. In fact, if you like some of the tapas, there are full-sized versions at the restaurant. 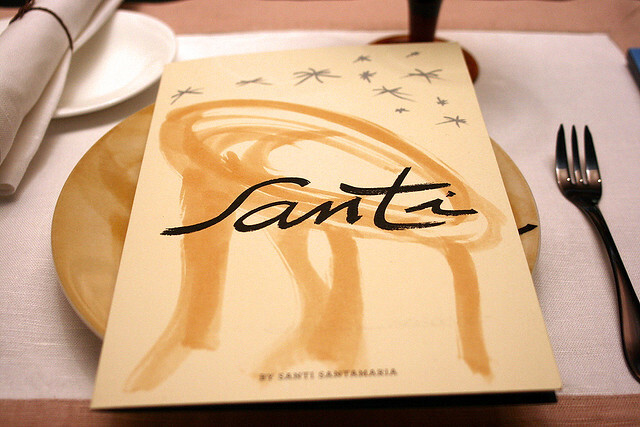 Although it's fine-dining, the atmosphere at Santi is remarkably cosy. 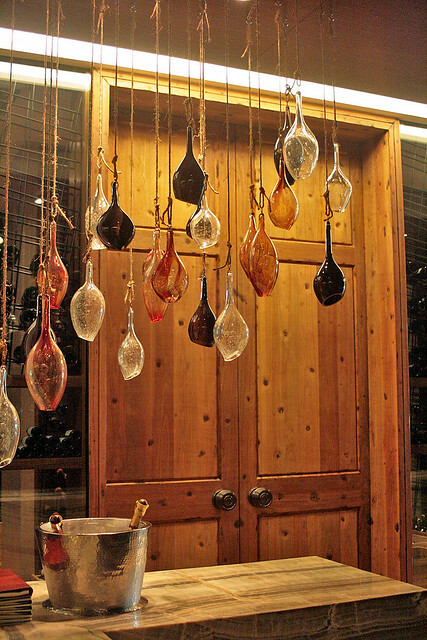 Rustic woods and little pieces of handblown glass add character to the place. The heavy wooden doors that you see are imported from Spain, just like many of the ingredients that they use. The quest for produce is the basis of my cuisine, together with imagination and the simplicity of those who strive for perfection. 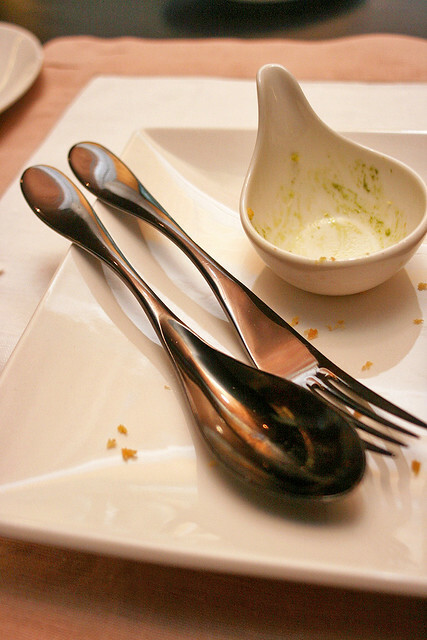 Indeed, they emphasized repeatedly how quality and authentic ingredients are so important. But obviously it's either impossible or impractical to import everything from Europe, so they do source for local or regional alternatives that can be fresher. But it looks like Santi is already winning some rave reviews all over the Internet. The tapas bar is open from 6.30pm to 11pm daily. Reservations are recommended. Thank you, Marina Bay Sands and Santi for the invitation to experience the memorable tapas. It was a pleasure meeting Santi and Regina Santamaria, who were such warm and wonderful hosts. Glad to hear that, ilcourt! Yes, you can ask and find out which ingredients they source regionally and such. MissyG: well, yeah, no lunch specials here for sure. Wonderful pictures! Thank you for this post and for the link. I've been wanting to try the tapas bar at santi. I like rustic restaurants, they look more like home, you can eat in peace, silent atmosphere.